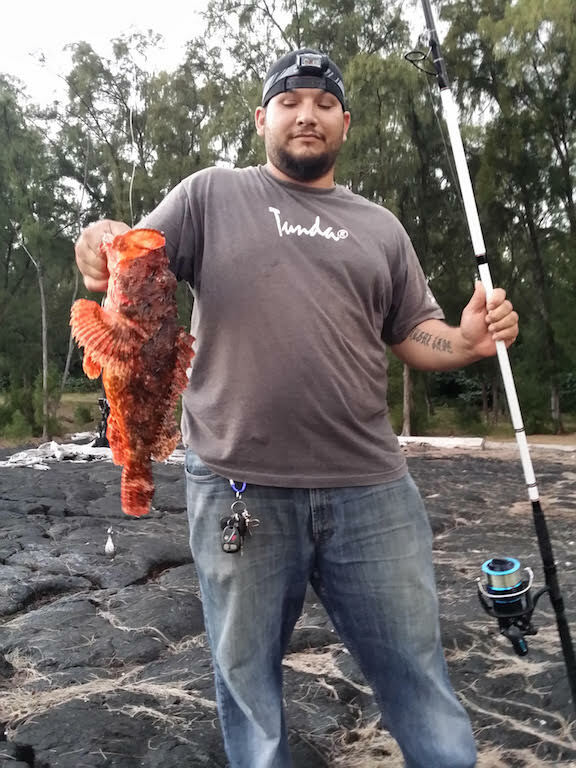 I was scrolling through the state record list and noticed HFN didn't have a record for a Titan scorpionfish, or nohu. I figured Id submit mine. This fish weighed 5 lbs and measured 19 inches in length and 14 inches in girth before gyotaku printing. I decided to join a couple of friends on an afternoon fishing session down in Puna. I had just bought some new gear and wanted to break in my new pole and reel. I set up my rig and threw out my very first cast on my new setup. I barely got the pole in its stand before it took a hit and bent over. After grabbing my pole, I began reeling. It felt pretty heavy, like pulling up a bucket of water. All of a sudden, out of the deep blue, I saw this big, reddish-orange blob appear. I was thinking, What the heck is that? My buddy, who was at the bottom of the cliff, started yelling, "Nohu! Nohu!" As I was helping handline this guy up the cliff, I thought, What an ugly fish! My buddy said, Look out! Dont let im stick you. Its poisonous. Not knowing what I had and thinking, Ah, its poisonous, I was about to toss it back. My buddy said, Don't do that. That's one of the best eating fish.